A tow truck driver was nearly killed along I-395, but a good Samaritan stopped and saved his life. Now, the driver’s family wants help finding the kind stranger. The crash occurred Monday morning as the tow truck operator was working on the shoulder near the Seminary Road exit, getting ready to tow two vehicles involved in a crash. Soon after a state trooper left the scene of the crash, police said another car on the road lost control, hit the guardrail on the left side and bounced all the way to the right shoulder, where the tow truck operator was. "It's absolutely getting worse," said Jon Redman, the owner of another towing company. "People don't stop at stop signs, they don't use turn signals and the slowpokes are running 75 miles an hour." The car that lost control hit one of the disabled cars from the previous accident and pushed it into the tow truck operator, severing his leg. Just slow down. 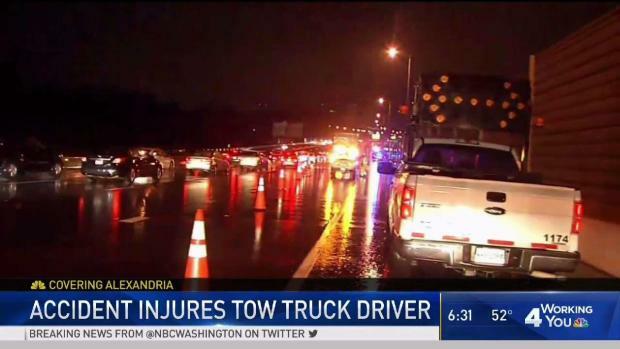 Tow truck drivers are pleading with people behind the wheel to slow down after a tow truck driver lost a leg in a crash early Monday in Northern Virginia. The victim's family is seeking a good Samaritan who stopped to help. News4's Julie Carey reports. Seeing someone with such a serious injury on the side of the road, one good Samaritan stopped and used his belt as a tourniquet until help arrived. The only thing family members know about this mysterious hero is that he is a military veteran, and they welcome any help in finding him to thank him. 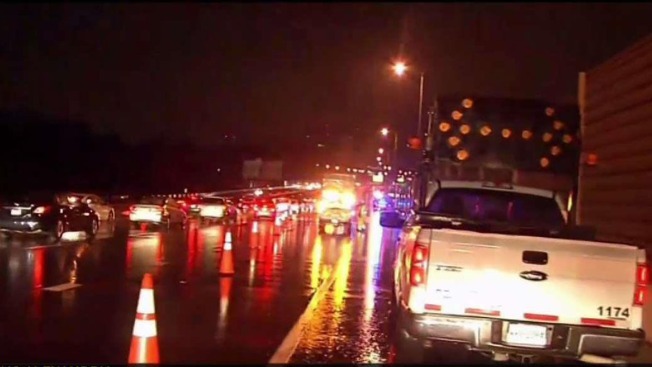 The crash highlights concerns among tow truck drivers who work alongside busy roads on a daily basis: Drivers need to slow down. "I can tell when you're going 70 or you're going 40 [miles per hour]," Patrick Ray, a tow truck driver from another company, said. "I can feel that when you're right next to me and I'm 3 feet away from the travel lane." Ray is a husband and father of three who said he loves his job of helping people after crashes or car problems, but he thinks small actions on the part of the drivers can go a long way to keep tow truck drivers safe. "If people would just realize, we have families to go home to, too," Ray said. "Taking a second to slow down or move over is not that difficult."